Taste test: These are pretty good onion chips. They're flavorful, tasty, fairly thick and have a good crunch. 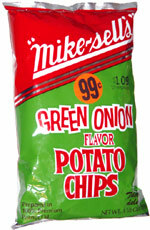 A nice change from the usual sour cream and onion, if you really like onions. Smell test: Mild onion smell, OK, not great.